The PATA Foundation awarded the grant to the Sala Bai Hotel and Restaurant School for the specific purpose of providing essential support to the outstanding students. In 2017, the school selected Mr. Sambol Sith as the recipient of the award. Mister Sambol SITH was born on the 12th of April 1993 in a small village, Trach Pok, in the Siem Reap province. His house is a very simple made with leaf. He studied until grade 12. During his studies, he stayed at the monastery. He applied to Sala Bai the first time 2 years ago to learn reception. His candidature was rejected because of this level of English. He was very motivated so he applied again the year after. His level of English was better. His parents are both farmers and he has seven siblings. 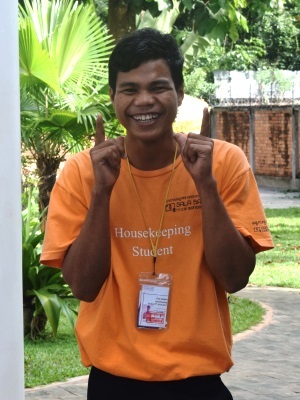 Sambol has started his vocational training at Sala Bai Hotel and Restaurant School on the 1st of September 2016 in the Housekeeping section. He participated with the other students at active learning workshops and conference : road safety, exchange with Netherlands students, hygiene and grooming, health prevention, child safe awareness. school and also at the accommodations. All the training team is pleased with Sambol SITH, he is very motivated. His level of English has improved a lot since he has been starting at school. Sambol SITH started to work the 1st of August at Aviary Hotel where Sambol did his first internship. His salary is $110 without service charges (5 %). Sambol was so happy to have the opportunity to join this hotel where he had worked for 2 months already during his internship.